Adriano Lopes de Melo, project coordinator at Conservation International (CI) in Brazil, and Cleiuodson Lage, manager of the Private Reserve of Natural Heritage (RPPN in Portuguese) Rio do Brazil, visited the Raja Ampat Research and Conservation Centre (RARCC) and P.T. Papua Diving Resorts during a work trip to learn how the Raja Ampat environment has been protected and to get inspiration for their work in Brazil. The RPPN Rio do Brazil, a partner of CI in South America, is a preservation area of 975 hectares in Bahia, in the northeastern part of Brazil. This conservation unit has more than 465 species of fauna and 540 of flora and, like the RARCC, has been teaching and working with the local communities in conservation. The two Brazilian forestry engineers visited P.T. 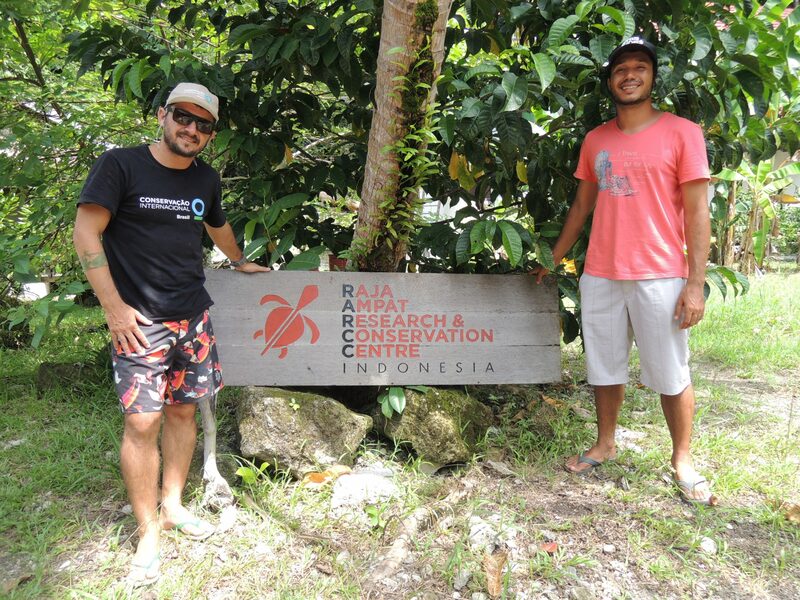 Papua Diving Resorts and the RARCC, historical partners of CI in Indonesia, also because Max Ammer, co-founder and manager of the company and director of the foundation, was the first to invest in ecotourism in Raja Ampat and he has been working on protecting the marine life since then. During their trip, they met different stakeholders in Raja Ampat, from NGOs and tourism operators to the local authorities. They were especially interested in learning how to “protect the natural capital with governance and how to strengthen productive systems, like sustainable tourism,” because the RPPN Rio do Brazil is also developing tourism activities, Adriano Lopes de Melo told the RARCC. On the other hand, they were negatively impressed by the amount of floating trash and mass tourism, in Pianemo for example, where they saw many boats touching the reefs. From their perspective, the government should take action based on a collective decision. They also defended the empowerment of the local players, so they can motorize and put pressure on the government. For instance, they said they heard many people complaining about the lack of control of the Raja Ampat Marine Park Entry Permit tag because apparently not all the tourists are paying it, and it seems unclear where the money is going since it should be invested in the local communities as well. During their visit, they asked many questions about the RARCC’s and P.T. 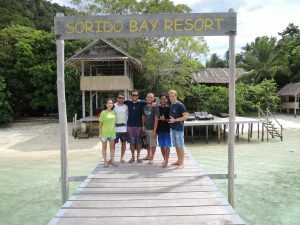 Papua Diving Resorts’ projects, especially those to protect the marine life. They were pleased to hear about our Bird-of-Paradise trips, our septic tanks to avoid nutrient pollution on reefs, and our support for the Raja Ampat Resorts Association, whose main goal is to help the local authorities to address some problems in the region. Cleiuodson Lage was surprised to hear about our work to help the local people in terms of nutrition, for instance, our project to offer indigenous communities farming sweet potatoes that contain a higher nutritional value in order to reduce the risk of vitamin A deficiency. They were also impressed by our hangar on the hilltop, where we are building two helicopters, one of them to use in conservation actions, such as detection of illegal activities and transportation of scientists.